Early Hornung (1870s or ‘80s), with iron plate in black, lettering in gold. In 1990, I received an invitation to Richard Hornung’s estate sale over on 27th Ave. in San Francisco. While perusing there, I discovered some of the relics behind the history of the Hornung family piano-making business. 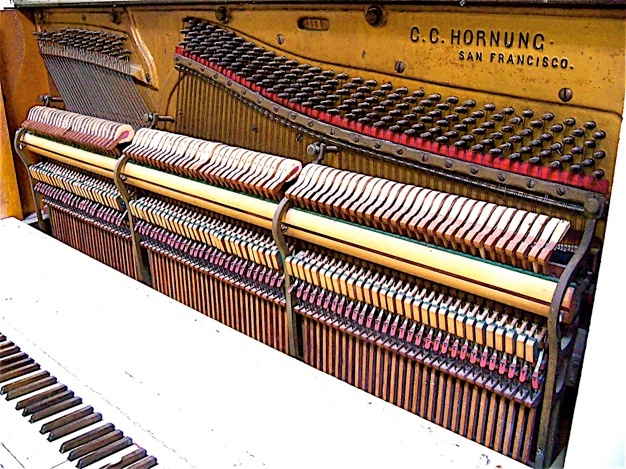 Richard C. Hornung (1902-1990) belonged to a long line of piano craftsmen: the extended family of the pioneering Danish piano maker, C. C. Hornung. 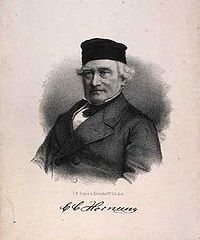 This is a portrait of Conrad Christian Hornung (1801-1873), a prominent piano maker in Denmark who founded C. C. Hornung Piano Co. in 1828. This company pioneered the use of the full iron plate in its pianos as early as 1842, around the same time period as Jonas Chickering introduced a full iron plate for his grand pianos in Boston. 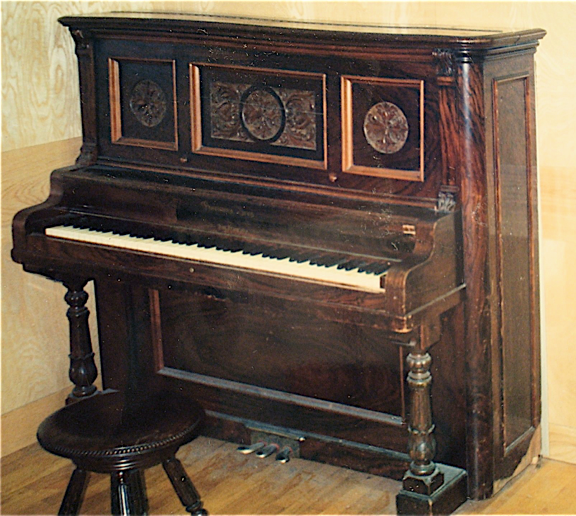 Alpheus Babcock, however, also in Boston, introduced the first known full iron plate in a square piano in 1825. More information is available from the Hornung & Møller page on Facebook (in Danish). In 1872, Conrad Christian Hornung, a nephew (b. 1842) emigrated to the United States. Between 1873 and 1875, he started to produce pianos in San Francisco where he, his workers, and his sons eventually made about 100 pianos a year. The Hornung factory located at was within the destruction zone of the fire immediately following the Great 1906 San Francisco earthquake. This marked the end of production at the Hornung factory. Back in the 1980s, I had heard a story from an elderly customer about the Hornung family producing pianos on a small scale after 1906, but had no way of verifying this, and I had thought that these pianos were probably restorations of other maker’s pianos. 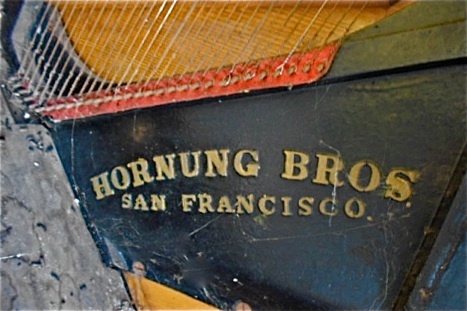 The Hornungs maintained a piano store in the 1930s and 1940s at 236 Eddy St.
“Conrad Christian Hornung, born in Slagelse, Denmark in 1842, came from a family of master craftsmen who have dominated the Scandinavian piano industry since its inception a little over a century ago. But unlike those of his own and preceding generations who found ready employment in the factory of Hornung and Moller (established by his uncle at Copenhagen in 1838), young Conrad gained most of his practical experience in southern Europe. After a period of schooling in Naples and Rome, he went to work for Collard and Collard of London, largest of Britain’s domestic piano producers during the 1800s. While there he married an English girl, severed his connections with Collard and Collard, and engaged in the piano-making business for himself. In 1872, hearing tales of the boundless opportunity offered by America, Hornung and his bride emigrated to New York, where, during the next year, a son was born. A growing dissatisfaction with New York was soon augmented by Hornung’s desire to visit the Yosemite Valley. In 1874 he moved his family to San Francisco, found the West attractive, and decided to make the city his permanent home. Almost immediately he was engaged by the piano maker Charles Hall, and later by T. M. Antisell, to help build, tune and repair the instruments these craftsmen were turning out in ever increasing number. Meanwhile, in the parlor of his home, Hornung made and perfected several pianos which were an improvement on the types then current. By 1880 he was again in business for himself, opening a store at 717 Market Street. San Francisco at this time had become music-conscious. Every family which could afford a piano was in the market for one, and few prospective buyers, once they tried a Hornung, could doubt its superiority over all but the most expensive imported makes. The dark-grained Alaska spruce used in the construction of the sounding board gave the Hornung instrument an exceptionally clear tone, and further improvements on the sounding board did away with the constant tuning the pianos of other firms demanded. Throughout it was durably built and artistically finished. It was made in the then novel upright style, which Hornung was one of the first to introduce. Prior to 1906, so successful was Hornung’s business, he four times had to find larger quarters. Some of his instruments contained a touch control, invented by a brother, Rudolph Hornung, in 1896. 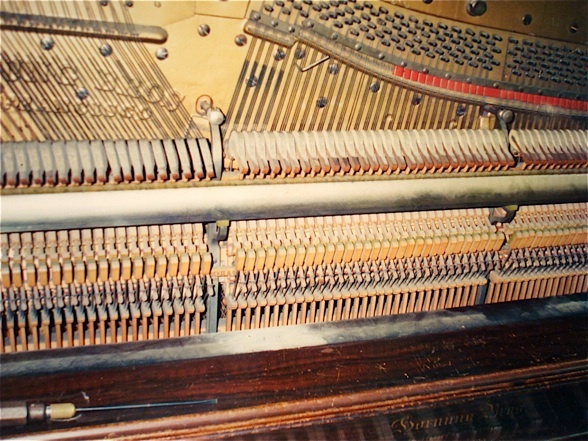 By turning a knob inside the piano, one could regulate the keyboard from stiff, to medium, to almost feather-like resistance; and since this device had been patented, no other manufacturer could adopt it. In the fire and earthquake of 1906 the Hornung establishment at 216 McAllister Street was reduced to a smoldering ruin. This meant, as in many similar cases, beginning all over again at the bottom. Hornung did so more literally than most businessmen, for the next instruments he produced were made in the basement of his home at 1762 Eddy Street, which fortunately had escaped destruction. Shortly thereafter he accumulated sufficient stock to open another store; and the house of C. C, Hornung, with two sons added to the firm, entered upon the second phase of its successful career. When Hornung died, in 1909, his sons took over the establishment he had left and continued its operations jointly until 1922, moving to the present (1941) location at 236 Eddy Street. In that year the elder son died prematurely, leaving the younger, Valdemar, in complete charge. Some large regulating tools for production work, found at Richard Hornung’s in 1990. A couple of these tools appear to be forged, possibly made by a local blacksmith. Four of the handles appear to be custom made by the Hornungs, and these fit the hand for the use of the tool very well. 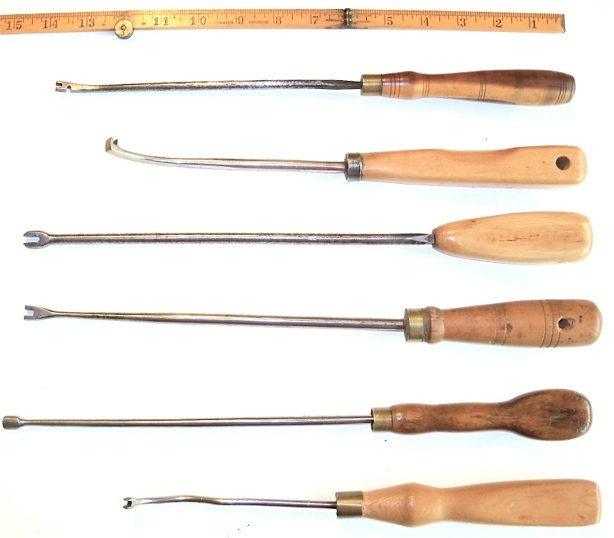 Many other regulating tools in this presentation came from the Hornung estate, such as those made or sold by Hammacher Schlemmer, Lyon and Healy, and Dolge, and appear in the Regulating Tools section of my site. Lyon and Healy wire bender with Tuck handle. 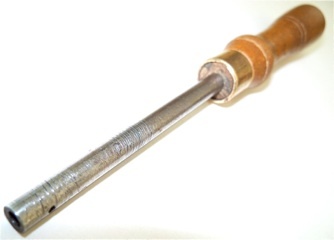 The socket diameter and depth suggest that this is a hitchpin tool. 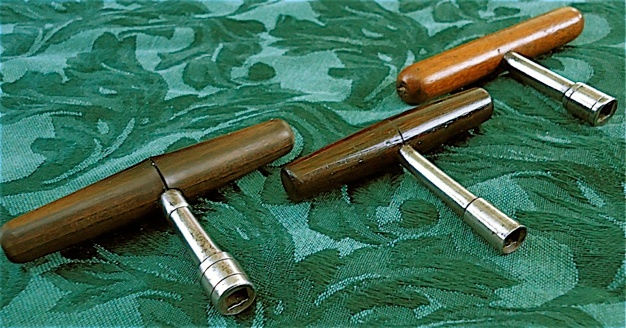 Three very small tuning hammers, all found at Richard Hornung’s. The rosewood hammer in the foreground has a 4.5 X 6 mm. socket, the rosewood hammer in the middle has a square 5.5 mm. socket, and the hammer in background has a 5 X 6 mm. socket. These socket sizes are appropriate for the tuning pins of pianos from the early to mid-19th century. Spokeshave, made from beech. This tool was user-made, probably with another spokeshave, because there are subtle but noticeable scalloped markings along its length. 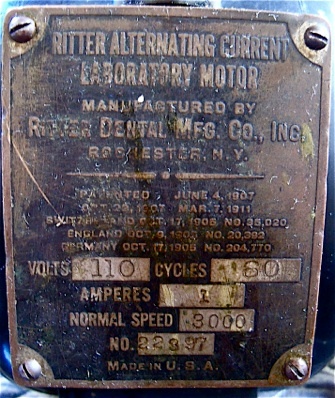 F. & N. Acier Forge wire cutters. This is a Spofford brace, originally patented in the US in 1859, also found at the Hornung estate. The handle is made of two pieces of rosewood held together with two pewter rings. This is not a brace specific to the piano and organ trade, but was likely used in the construction of their upright pianos as discussed in my page of pianomaker’s braces. 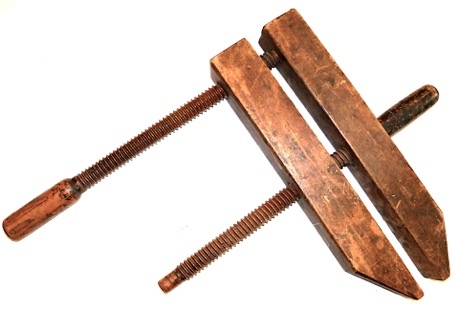 One of many old wood clamps found at Richard Hornung’s. I still use these clamps. 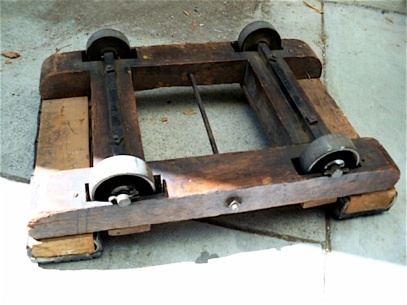 A dolly, also from Hornung’s, with its heavy iron wheels, and oak construction was clearly intended for industrial use. Hornung’s name is barely visible (not in this photo) on the bottom in large black stenciled letters. Some pieces were added to raise the cargo in later years. 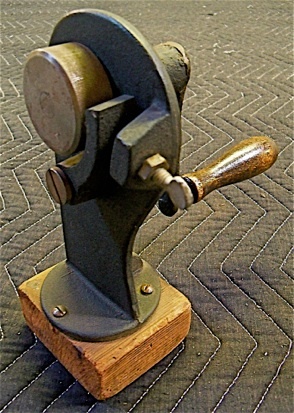 Variable-speed buffing and grinding machine, patented 1911. This still runs very smoothly, and is extremely heavy! Old Hornung upright, with a beautiful case. This is an old Hornung upright that I worked on c. 1991 at the Mission Masonic Center in San Francisco, if I remember correctly. It was all original, with a Wessel, Nickel, and Gross action, rosewood case, and in very tunable condition. The action parts were beautifully spaced, even after all those years. This piano had a good tone. Exterior of the Hornung upright. 1906 Hornung upright, that is less ornate, with wooden action rails and flanges, in comparison with the W.N.G. 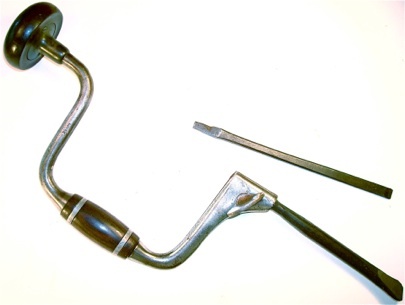 brass rail action in the example shown above. This is one of the last production Hornung pianos made in the 216 McAllister Street factory before the 1906 San Francisco earthquake and fire. 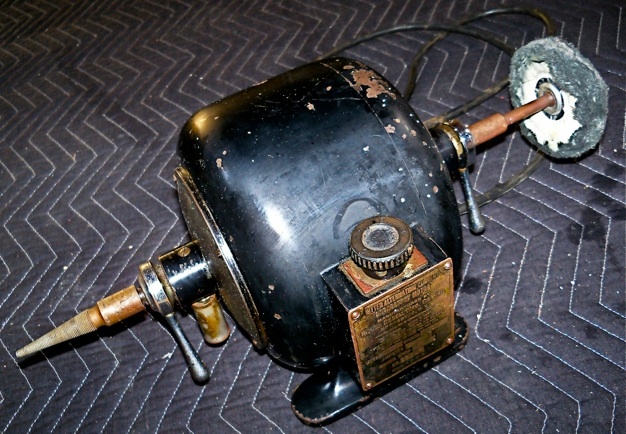 This instrument belonged to a San Francisco Bay Area family who contacted me after reading this web page. Despite the fact that restoring this piano is impractical, I am considering it, because of its historical interest as well as to satisfy my curiosity regarding the potential outcome, especially tonally. 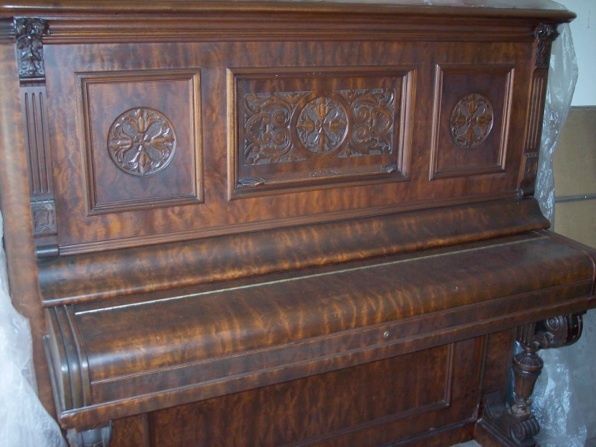 This Hornung 58″ upright piano has a lowest bass string as long as that of a Steinway “A” 6′ 2.” While still Victorian in its details, the case is simpler in design than the two examples shown above it on this page. Like many ‘California pianos,’ it is relatively well preserved structurally, with clean bridges and soundboard. Update: Robin and Richard Hornung, Jr. read this webpage and purchased this piano for their descendants. The piano is now in the process of being refinished. Disclaimer: All expressions of opinion and all statements of supposed fact are published on the authority of the author as listed, and are not to be regarded as expressing the view of the Piano Technicians Guild, Inc., unless such statements or opinions have been adopted by the Piano Technicians Guild, Inc.